This handsome Greek Revival structure, standing proudly at the intersection of North Main and North B Streets, was once home to Easley First Baptist Church. 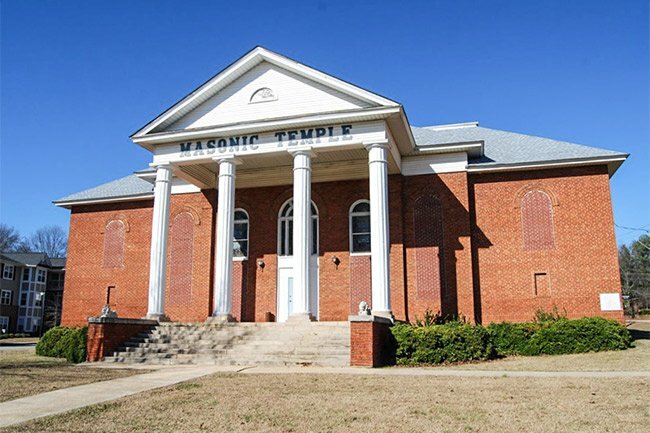 The building now serves as a masonic lodge dedicated to the Ancient Free Masons of South Carolina. Freemasonry meetings as well as community-centric events take place here throughout the year. 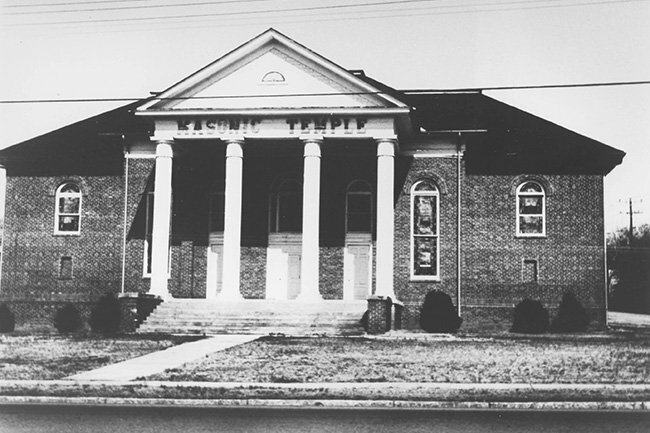 In November of 1873, an assembly of Baptists met to discuss the formation of a Baptist church in Easley. The twelve charter members agreed that this site would prove suitable, and they constructed the first church to stand here in 1874. 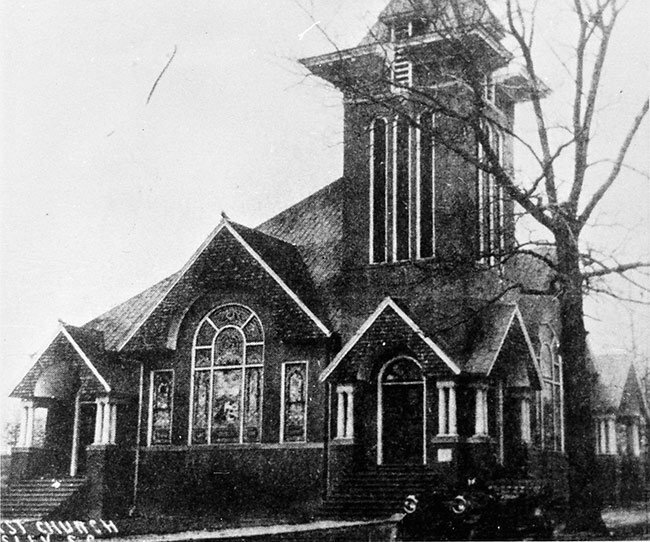 Pictured below, the original sanctuary was of frame construction with a prominent bell tower. The Reverend David Weston Hiott led First Baptist’s congregation at that time. 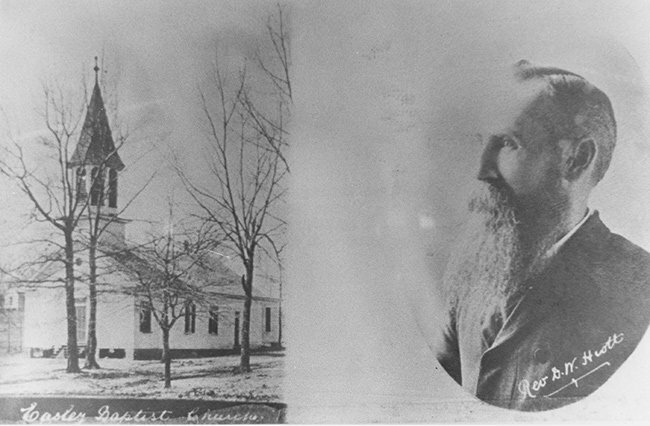 Hiott was born in 1852 and studied at the Southern Baptist Theological Seminary. For most of his 50 years of religious service, he practiced in the Piedmont region of South Carolina. He was prominent in the Masonic and Woodmen orders and is said to have been beloved by those who knew him. He died at the age of 75 in 1928. It is not known what happened to the original sanctuary, but a second sanctuary was built here by 1909. This church served First Baptist until it burned in 1917. The building was larger and more elaborate than its predecessor, featuring stained glass windows, multiple columned porches, masonry construction, and a large bell tower. The congregation met for services in a school auditorium for the next four years until another building could be constructed. The third and last church built at this site, the one seen today, was constructed in 1921. The total cost of construction was between $25,000 and $30,000. The portico is graced with imposing columns. 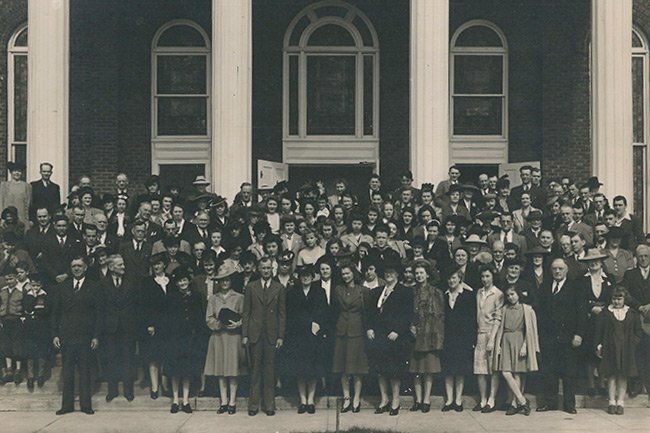 By the 1950s, the congregation outgrew the space and moved to its present site directly across the railroad tracks, within sight of its old location. The final service was held here on January 20, 1952. The building was converted to the Bates Masonic Lodge #189 sometime that same year. The lodge serves as the headquarters for a local chapter of the Ancient Free Masons of South Carolina. Freemasons are members of what is considered the oldest fraternal organization in the world. Its teachings are designed to improve members’ character, citizenship, and community responsibility. Masons have gathered in South Carolina since 1735; the Easley lodge was officially chartered on December 15, 1875. Hello Jimmy, thank you so much for reaching out to us and providing this great information. We would LOVE to expand this page as it is one of our older ones that is in some need of redoing. We are excited to see if you have those photos and we will begin researching more information. We are going to send you over an email too so we can stay in touch that way. Thanks again! This building known as Bates Lodge was used formally by the Congregation of Easley’s First Baptist Church. This was the second building that housed the church the previous structure had burned. After The Church found more land (which is within eyesite of this structure) They built another building and this structure was sold and became Bates Lodge 189. Most of the stained glass windows were removed and bricked over as visible in the photo shown here. I have seen photos of this building with the church members standing in front of it, I will try and locate them and submit them I maybe able to find the date of construction of the Building now know as Bates Lodge. I thought I’d at least add this much info as apparently no one knew the history before the Masons accquired the structure.